One of the best Bank in the Pakistan’s top banking list is the Askari Bank and they announced the career opportunities for the candidates who’s want to join the Askari Bank and they have a great chance now to join the Askari Bank. 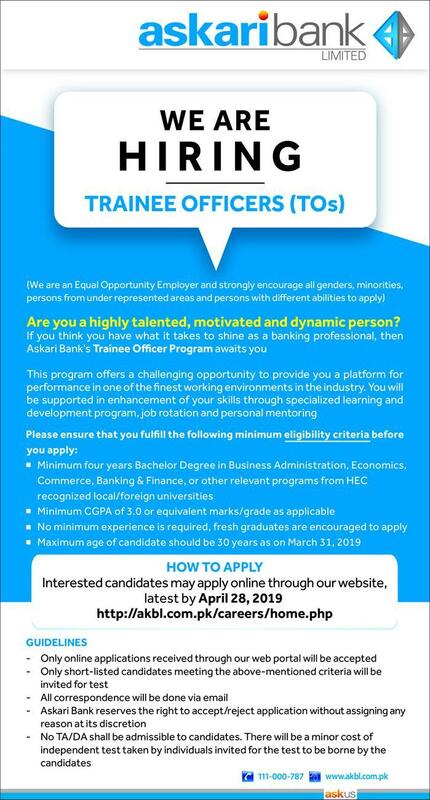 Because Today Askari Bank has announced the Trainee Officers Program for the year 2019 if you are interested then you must apply for the Askari Bank Jobs 2019 Trainee Officers but you must fulfilling the eligibility Criteria and you must be competent for these jobs 2019. Once you must read the eligibility Criteria carefully and if you are fulfilling the eligibility Criteria then you must apply online for these Jobs 2019. Because we provided the online apply here at this page. Candidate Must have Minimum four years Bachelor Degree in Business Administration, Economics, Commerce, Banking & Finance, or other relevant programs from HEC recognized local/foreign universities. Once you apply for these Askari Bank Jobs 2019 Trainee Officers online then you must start preparations for its test and interview because First of all your application forms will be analyzed by the official recruiter departed then, They will will shortlisted the candidates and they will called the shortlisted candidates for the test and once you will clear the test then they will call the candidates for the Interviews and once you will clear the interview as well then they will set merit list and send the call letter to the selected candidatures. Interested candidates may apply online through our website. Application Form Submission Last Date is April 28, 2019. Must fill the online application carefully. Don’t make any mistake when you are filling the form online. Recheck Complete form before submitting the information online. Talley the Document data and form data both both will be same. Don’t enter the wrong details and data in the form. Submit the online application form before the closing date. Bring the Original Documents when you appearing in the interview.